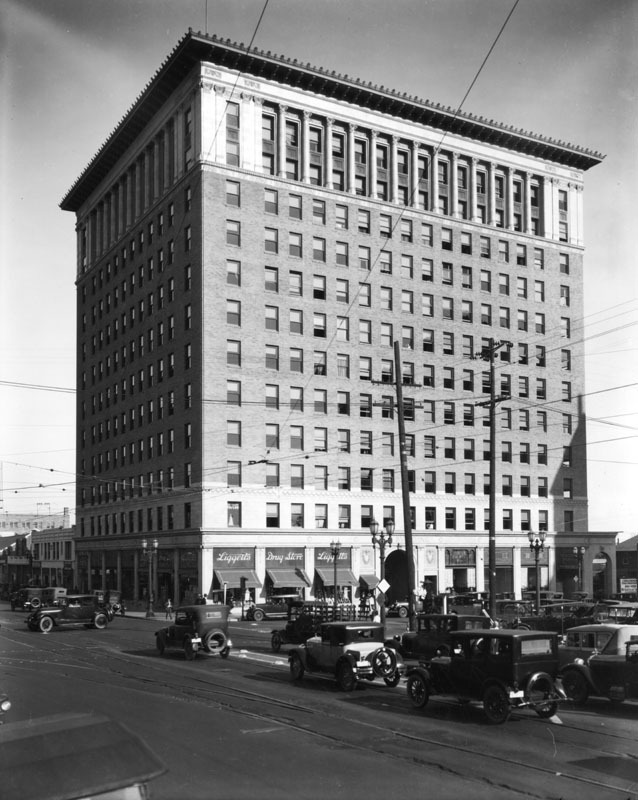 The Taft Building in Hollywood on the southeast corner of Hollywood and Vine, at 22, was the community’s oldest skyscraper. On August 6, 1946 it got a new addition to the outside of the 4th floor: KFWB’s “Flashcast” news strip, flashing out the day’s headlines in real time. The concept wasn’t new. 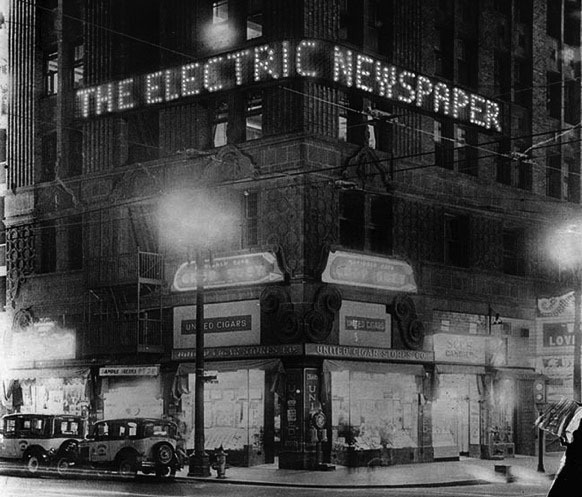 On October 12, 1931, the Los Angeles Times had unveiled its “Times-Richfield Electric Newspaper” on the side of the Paramount Theater at the northeast corner of Sixth and Hill downtown, which they said was the first of its kind in the Western Hemisphere (the New York Times had used an earlier version of the idea, consisting of steel-framed letters illuminated by lightbulbs in the frame that had to be changed by hand, like a theater marquee). In the Times-Richfield version, multiple banks of stationary lights formed the letters by the automated lighting of selected bulbs in sequence along the panel, giving the effect of a moving sentence. 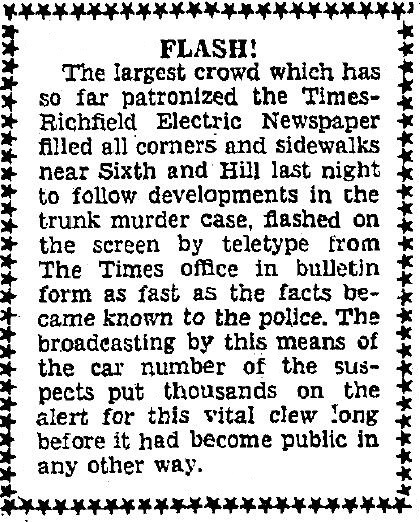 One of the biggest scoops of the newly-installed Times-Richfield Electric Newspaper was the newsflash of what would be known as the Winnie Ruth Judd trunk murder case, when the bodies of two murdered women were found in trunks checked at the Southern Pacific passenger depot on October 19, 1931. Mrs. Judd surrendered to police here on October 23 at the Bunker Hill funeral parlor of Alvarez and Moore, 500 Court Street. 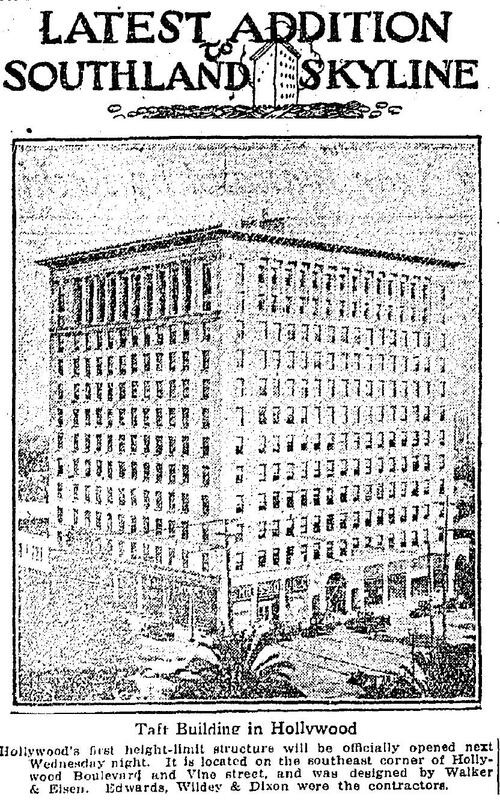 The gala grand opening of the Taft Building, designed by Walker & Eisen, and its ground-floor corner drugstore, (originally a Kress-no relation to the 5&10 chain- later Liggett’s, then Owl-Rexall) on August 20, 1924 with a battery of searchlights and Hollywood screen stars in attendance, some of them manning the drugstore counters. 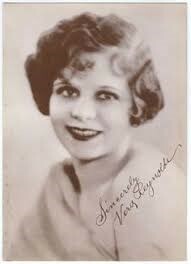 Vera Reynolds set the high-speed elevators in motion for the first time. 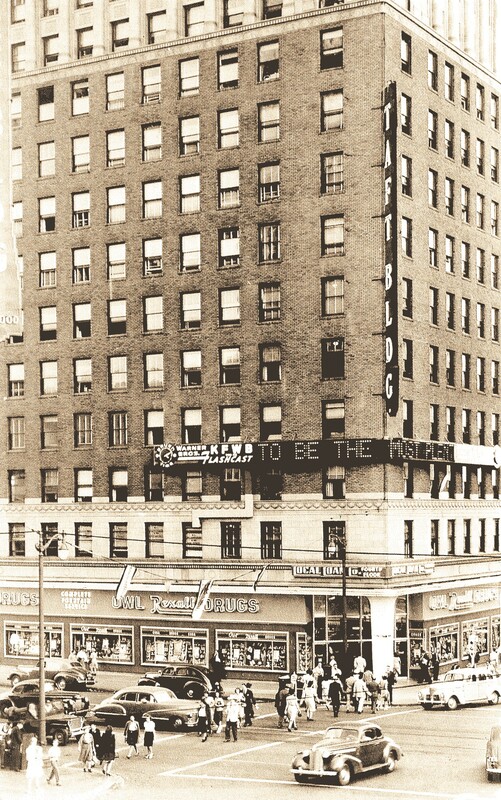 The Taft Building at the corner of Hollywood & Vine c. 1928 before the H.B. 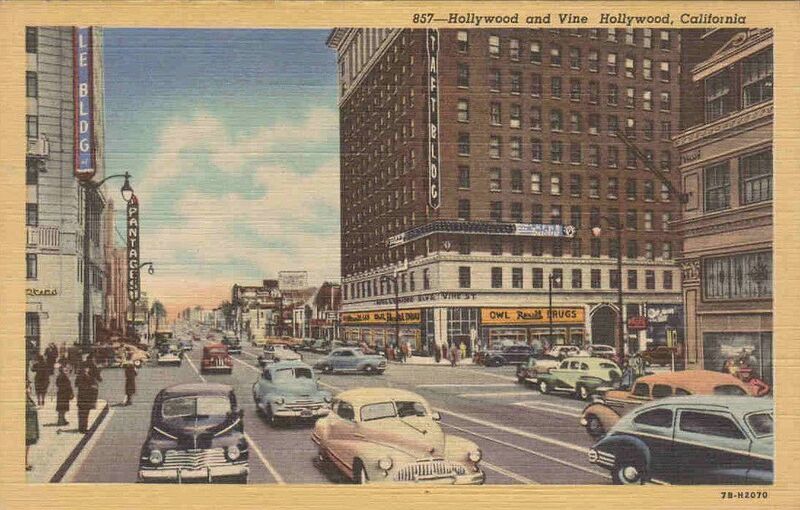 Dyas (later Broadway Hollywood) department store building went up cross he street. LAPL. 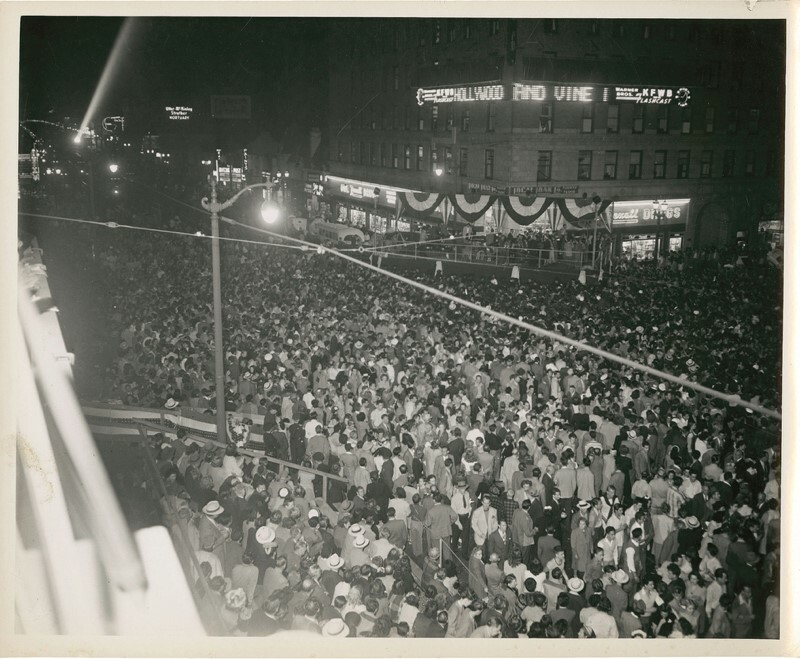 A street corner stage and bleachers for fans were built at Hollywood and Vine for the Flashcast installation ceremony, which included a broadcast of Hedda Hopper’s “This is Hollywood.” Warner Brothers (the WB in KFWB) was also celebrating its twentieth year of sound picture technology, with additional festivities don the street at its Hollywood Boulevard theater. 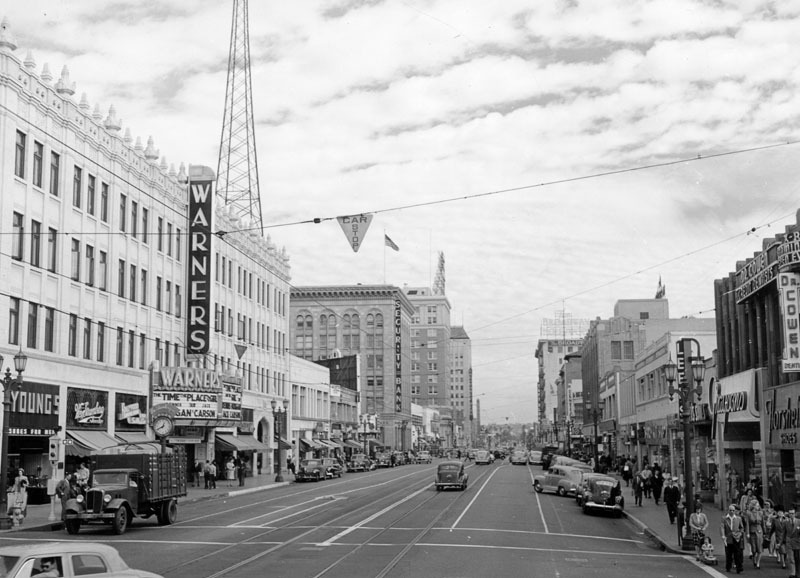 KFWB’s towers were on the roof of Warner’s Hollywood theater, seen in this January 1946 photo when it was showing The Time, The Place and the Girl. The Cole Porter biopic Night and Day with Cary Grant and Alexis Smith was screening on 8/6/46. The Taft Building, with the flashcast ticker blaring murder headlines, can be seen in the postwar noir The Unfaithful starring Ann Sheridan, Lew Ayres and Zachary Scott, which debuted in Los Angeles on June 25, 1947 (It was, after all, a Warner picture).